Northampton residents enjoy an ever-shrinking commodity… large yards. But this amenity comes with a price: More lawn to water = higher water bills. Often our large yards are watered too often and for too long with water frequently running off into the streets. With the cost of water rising and aquifers depleting, we need to be diligent in reducing our water consumption. The EPA estimates that about 30% of residential water usage is devoted to outdoor uses. 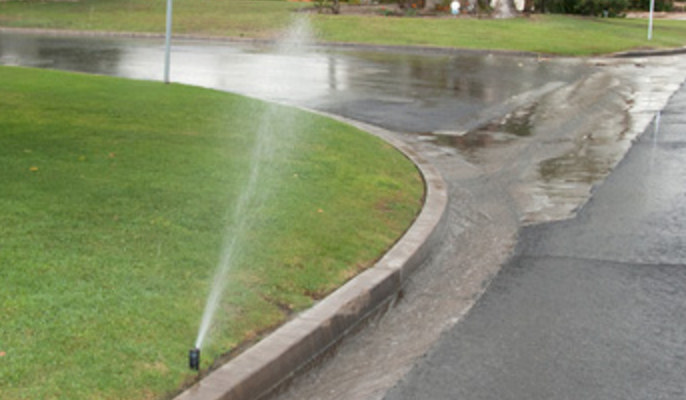 To help residents conserve water, the District is supplying free rain sensors to residents who would like to install them on their automatic sprinkler system. A sprinkler rain sensor operates via a gauge mounted on an external arm, that is mounted on a fence or roof gutter near your lawn or garden, attached to the sprinkler system. Disks inside the gauge absorb water and expand more as rain continues falling. These send a message to the sprinkler system controller, interrupting the electronic signal that turns on the sprinklers. The signal is blocked until the disks shrink again to their dry size. The sprinkler controller then receives the start signal, and resumes its spraying schedule. Estimates vary, but a rain sensor could save you as much as 30% to 45% in outdoor water consumption! To receive your free rain sensor, please visit the MUD office, M-F 8:30- 4:30.